resources. 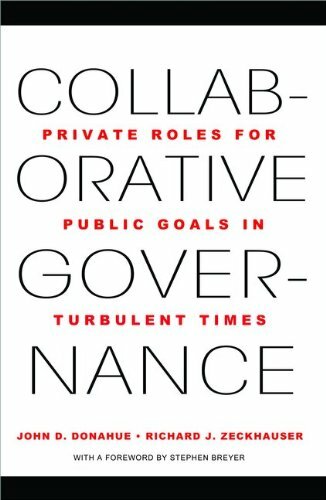 The authors explain how private engagement in public missions--rightly structured and skillfully managed--is not so much an alternative to government as the way smart government ought to operate. The key is to carefully and strategically grant discretion to private entities, whether for-profit or nonprofit, in ways that simultaneously motivate and empower them to create public value. Drawing on a host of real-world examples-including charter schools, job training, and the resurrection of New York's Central Park--they show how, when, and why collaboration works, and also under what circumstances it doesn't.Collaborative Governancereveals how the collaborative approach can be used to tap the resourcefulness and entrepreneurship of the private sector, and improvise fresh, flexible solutions to today's most pressing public challenges. Stephen Breyer is an associate justice of the United States Supreme Court. He is a resident of Cambridge, Massachusetts, and Washington, D.C. From the Hardcover edition.